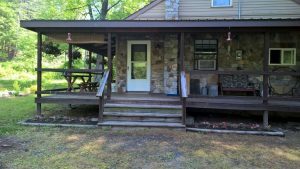 We have 3 cabins and a former hunting lodge located in a delightful heavily wooded setting on Little Pine Creek, (a stocked trout stream) just below the Little Pine Creek State Park. Each of these facilities has all of the conveniences for modern living, including high speed internet, TV, and phone service, plus all of the standard amenities, including showers, kitchen, etc. 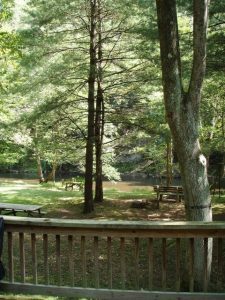 The Bear Cabin and the Trout Cabin both border on and overlook the stream among huge old trees which provide a cool and serene environment. Executives, who can work from home, have found our facilities to be a delightful place to continue their work activities, yet have some of the nation's best fishing only a short distance away. 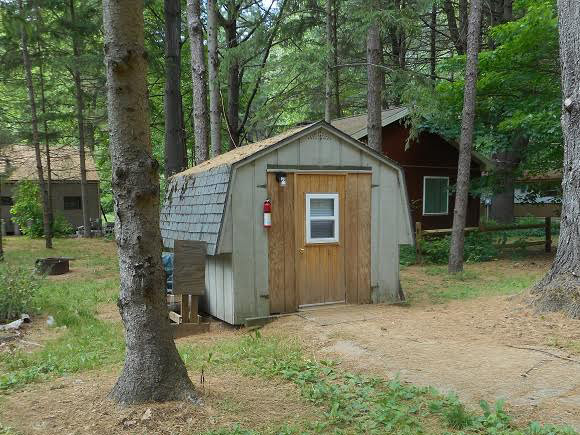 A 23" rainbow trout was taken by a tenant, within view of the Trout and Bear cabin porches. (May 2016) In April, a "burned out" executive spent almost a month recuperating, and reported that he felt 100% improved, when he left. We suggest you take a look at each of our facilities, which can sleep from 2 to 15. A bunk house is centrally located and can sleep an extra two people. Check out this beautiful buck a recent guest brought off a nearby mountain by clicking here. 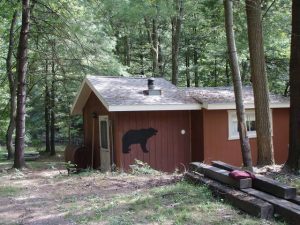 The Bear Cabin < Click for more info and pricing. The Bear Cabin has 1 bedroom with a full sized bed which sleeps 2, and a bunk bed which also sleeps two There is a pull-out couch, as well. The cabin has all of the amenities for modern living, including high speed internet, TV, and phone, There is a very nice bathroom, complete with vanity and shower. The kitchen has a stove, fridge, coffee-maker, and most of the other amenities one would expect to find. 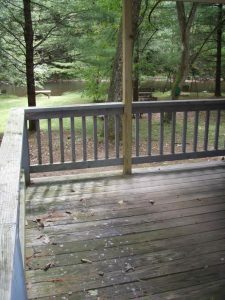 There is a very large deck, shaded with big old trees, with gas grill, that overlooks the creek, as well as a nearby animal feeder. Click here for more info and pricing. 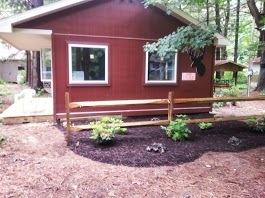 The Trout Cabin < Click for more info and pricing. 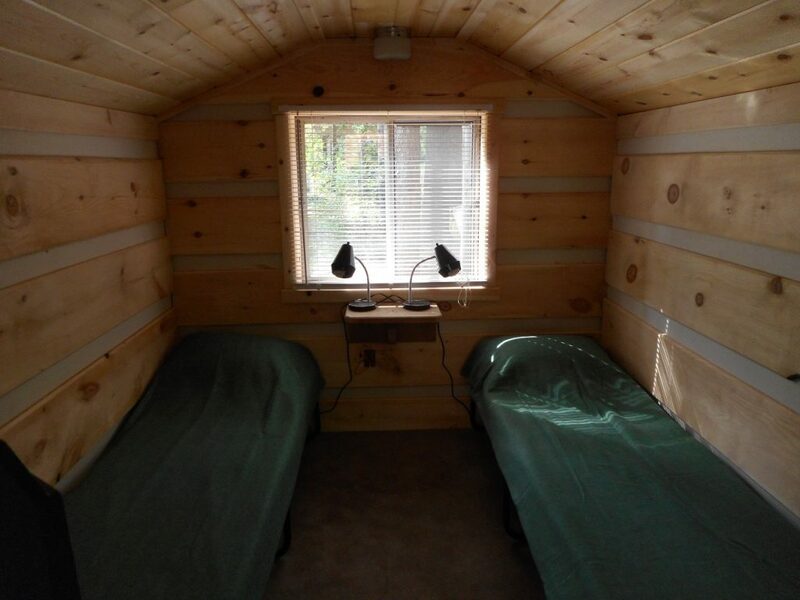 The Trout Cabin is a one room cabin, perfect for a couple, by itself. It does have a pull out couch which will sleep two extra, and the bunk house is only a few steps away, which will sleep two, and is very reasonably priced. It has a bathroom with shower, kitchen with stove and fridge, plus most all of the amenities expected where meals are prepared. There is high speed internet, TV, and phone service. The dining table has two large picture windows. One overlooking the creek, and the other with a perfect view of the animal feeder, located next door. Click here for more info and pricing. The Deer Cabin < Click for more info and pricing. 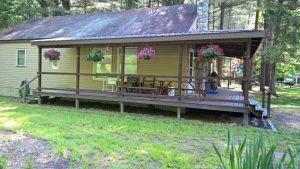 The Deer Cabin is located 4 miles from Waterville, and 3/4 of a mile from Little Pine Creek State Park. 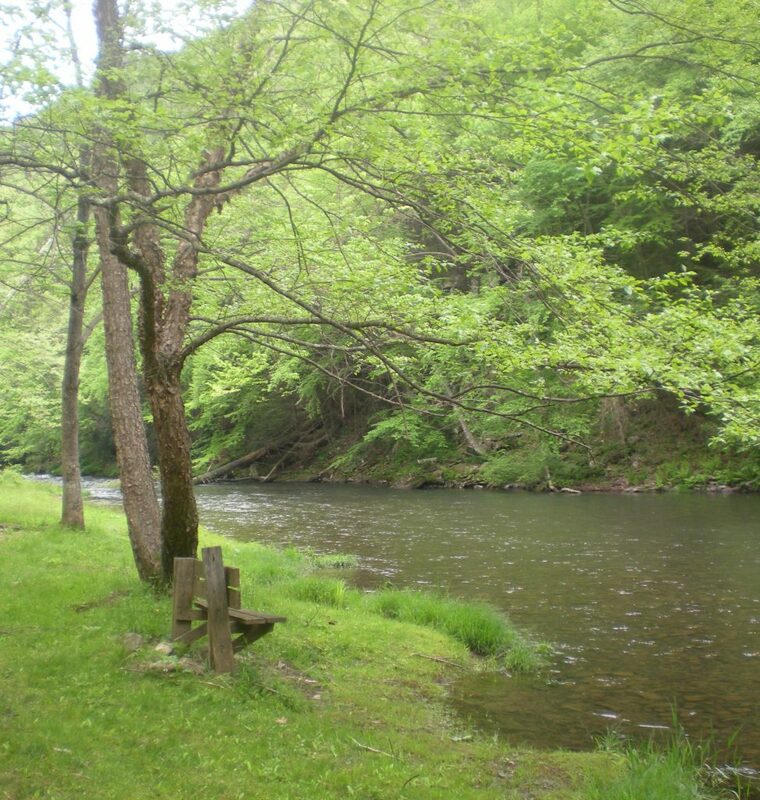 It is only 50 yards from Little Pine Creek, a stocked trout stream, and is in a shaded setting of very large white pines and oaks. A nearby animal feeder attracts wild turkeys, deer, and a host of other "critters". 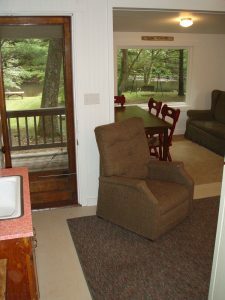 There is a stone fireplace with picnic table in a small pavilion to the side of the cabin. Two bedrooms, one with a double bed and the other with a bunk bed, makes it perfect for a couple with two children. Click here for more info and pricing. The Turkey Lodge < Click for more info and pricing. The Turkey Lodge, sleeps 12-15, has 3 bedrooms, with room for additional bunk beds, and possibly other sleeping accommodations. 1 bedroom has two double beds, the 2nd bedroom has a single double bed, and the bunk room has three beds, with room for more. It also has two bathrooms, and 2 showers, plus a bath tub. It has a huge combination kitchen, dining, living room, as well. Click here for more info and pricing. ^ Click for more info and pricing. "Perfect for a couple. 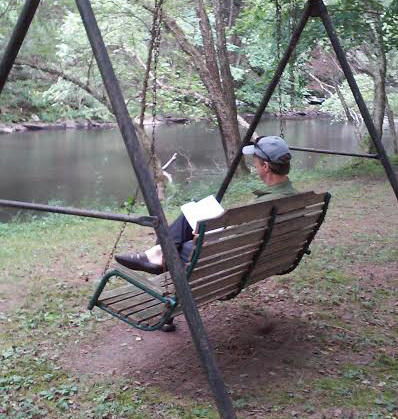 Has everything you need for a relaxing getaway. Very quiet place in a 6 cabin "neighborhood". There is a small 2 store town about 2 miles away if you need anything. The caretaker, John, is very nice and stopped by on my check in day to make sure everything was ok, super friendly guy that is very knowledgeable about the area and local hiking trails..."
Everything was just as described and more!